Oracle BPM tasks can be dynamically assigned to an individual user, application role, and / or an LDAP group depending on the human task’s incoming data. They did not have to be separate strings, but for clarity these three human task data elements have corresponding process data objects mapped into the human task in this Oracle BPM 12.2.1.2 application. Based on which one(s) is populated, the task’s assignment is made. These are set in the activity’s input data association from corresponding process data objects. 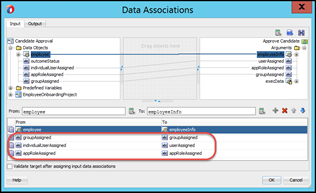 The process data objects are set in the output data association of an activity upstream of the activity in the process. Read the complete article here.